Yes, there were two centerpieces this year. Miguel had ideas of his own and did not want to participate in the realization of my idea. So, he announced that he was going to make his own centerpiece. I had no problem with that but Luisa collapsed in a heap as she imagined the stress of two artisits and their independent peep visions. 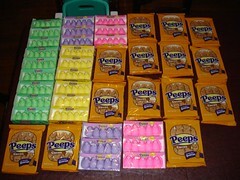 We had a lot of peeps to work with this year and, if anyone needs any, we have exactly 100 peeps left over. As you can see from this photo, we took advantage of the new green peeps as well as the new cocoa bunnies. I will admit that the yellow peeps were sorely underrepresented. This is my creation and I am sure that you are immediately struck with the deep symbolism of the work. 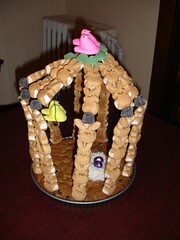 This is a cage created from the cocoa bunnies. Inside, you see two yellow peeps on a swing and, below them, you see a nest of coconut with two chocolate eggs. 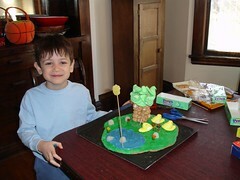 Here is a picture of Miguel with his centerpiece. Again, the work is wrought with complexities. This is a park scene in which peeps picnic beneath a tree made of their own kind. They rest near a beautiful pond lit by a gumdrop sun.